A Night in Paris is nothing like the movie Midnight in Paris, although there is the element of thrill and mystery. 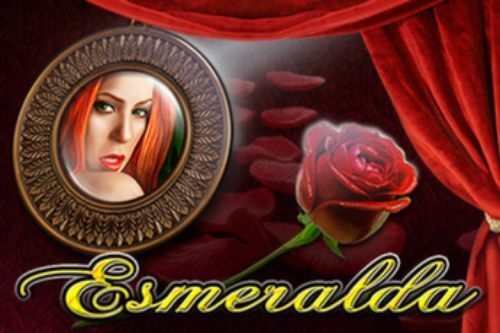 This slot is about a skilled thief, a regal gentleman and a scholar who is onto a cache of immense riches. The game has five reels, three rows, expanding symbols and 30 paylines. There are plenty of good symbol pays, as well as a bonus feature that comes in the shape of free spins, a cap on the bet of £75.00 and, ready? a jackpot prize that is paid when a set of symbols land in a specific sequence - named below. Step into the city of light to play the Night In Paris slot. This five reel game with 30 payline made by the slots experts at Betsoft, offers an in-game jackpot whose amount changes with the coin size. With the top prize of more than £25,000 the luckiest players out there may be in for a pleasant sightseeing surprise. Set in the French capital, this glamorous slot sees you encountering crooks and cops against a backdrop of Parisian landmarks. As befits a slot in this setting, A Night In Paris benefits from Betsoft's brilliant animated graphics. 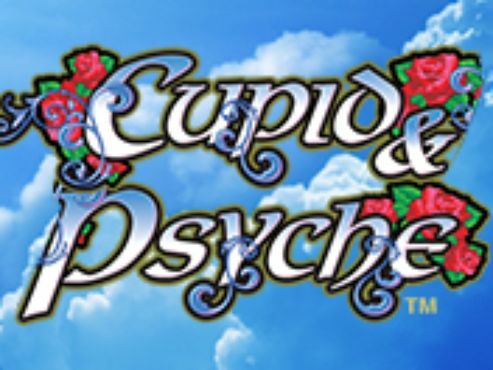 The various characters (including a gregarious bulldog) roll around and interact with you, and the game is one of the more visually arresting of Betsoft's earlier titles. There are some decent bonus features, though, and the excellent Caught In The Museum game sees you rounding up famous artworks. Enjoyable and funny, A Night in Paris slot is a great way to reminisce about the adventures that may fall upon any one who is lucky enough to win the game's jackpot prize. Setting up the gameplay takes some finding your way around paris. You are located in a park, with two sitting benches in front of you and an ornate reel-set which appears as if it has been taken from the Louvre. You will notice immediately that the benches have given a comfortable rest to the Select Lines and Spin buttons, while the bushy plant between them is, oddly, the Bet Per Line setting. Yet another bushy plant offers a way to set the coin size, which starts at just a penny and goes all the way up to £1.00. You will notice that changing the coin size also changes the amount of the jackpot, but we will get to this in just a bit. The Select Lines buttons offers to the player setting up the number of active paylines. There is a total of 30 lines, but that number can be set to just a single active payline or any number in-between. If the player chooses to go high-stakes and play with the highest bet per spin of £75.00, then the Max Bet Spin button, which is next to the bulldog, is readily available for some thrilling reel action. 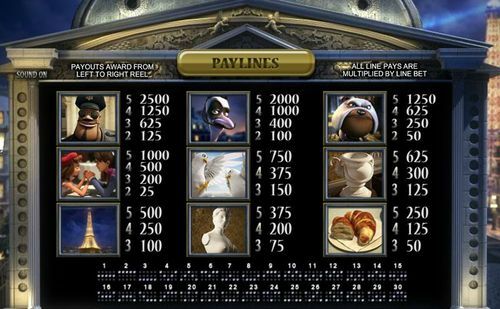 Besides the top cash payout of £25,165.13 the Night In Paris slot has exceptional design features. There is a grid of five reels and three rows filled with an array of amusing symbols. 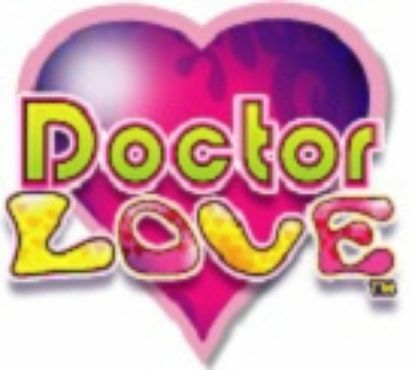 You will find the high valued square-chinned police officer, the slim and stereotypical French class thief, the bulldog and the lovely couple with their palms embraced in lots of love. The lower-valued symbols are the pair of doves, a highly prized antique vase, the Eiffel tower symbol, a marble bust of a goddess and the inevitable French croissant. 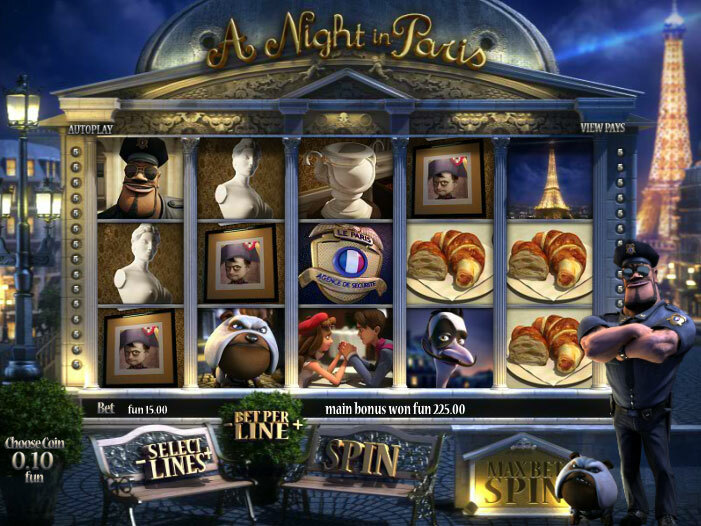 Night In Paris slots has an exceptionally smooth gameplay which is introduced by a lengthy animated sequence that has a couple in love enjoying the City of Light and heading to the cafe and to the museum, and do all the touristy stuff that one can do there. Meanwhile, there is a pursuit of a thief who has a knack for picking up prized items from one of the most celebrated museums in the world. That’s the story line, we like it, but we also like the top cash payout, and we have few words on that right below. Winning the game means landing some hefty amounts or the game's jackpot. That is only possible by having great amounts of luck and being on the game at the right moment in time. In other words, it is no secret that slots do not require any skills to be played, because these are games of chance in which the random number generator leaves everything at the hands of Lady Luck. So to win the jackpot you have to land a sequence of symbols in the following order: Thief; French Police Badge; Cop or Cop; French Police Badge; Thief - and, Voila! One of the ways of winning a really strong payout combination is to land the top paying regular symbol of 500, on a high wager. Another way to elevate your chances of winning some neat cash prizes is to land the French Police scatter symbol in three instances, which will trigger the Free Spins games in which the bulldog chases the thief, while you are anticipating the landing of strong winning combinations. Then there is another bonus feature which occurs with three or more of the portrait painting symbols landing anywhere on the reels. This triggers the Caught In The Museum second screen bonus in which the thief has slipped inside the museum. The police officer, know as Jerome LaBaste, will bust the thief and bring some reward cash for you helping with the pursuit. 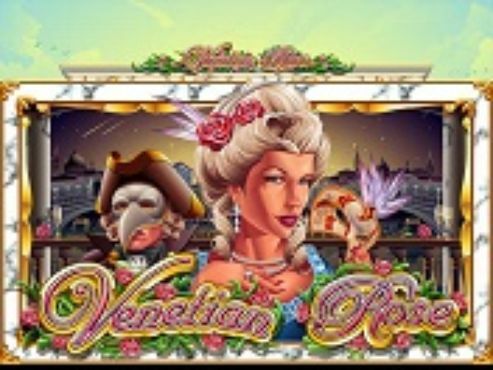 To play Night In Paris slots, you can start by claiming your welcome bonus right from this page and selecting from a list of top-notch casinos in the UK.